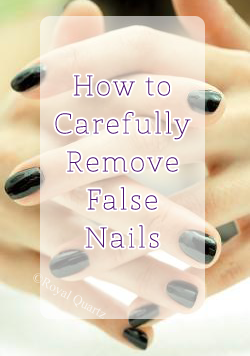 A how-to guide for how to successfully remove false nails without damaging your natural nails. Apply a thin layer of petroleum jelly on your cuticles and the skin at the tips of your fingers (that area that’s underneath nails as they grow). Applying the petroleum jelly will prevent these sensitive areas of your fingers from drying out and becoming sensitive from the acetone.